A NASA SR-71 rotates, its signature “donuts on a rope” exhaust trailing behind. I’m not much on book reviews, but recently, I came across a new, coffee-table book I couldn’t put down. In fact, it was more likely a book I couldn’t pick up. “The Complete Book of the SR-71” is a massive, 10” x 13”, 260-page work by Colonel Richard H. Graham, USAF (retired). Following 210 combat missions flying an F4C in Viet Nam, Col. Graham volunteered for, and was selected to fly the Lockheed SR-71 Blackbird in 1974. He became the squadron commander of the SR-71s, U-2s and T-38s based at Beale AFB 40 miles north of Sacramento, California in 1980, and went on to command the entire 9th Reconnaissance Wing at Beale in 1987. Colonel Graham is probably the ultimate expert on the SR-71, and this is the latest and most comprehensive of four books he’s done on the at-once futuristic and now quite vintage aircraft. I’ve been fascinated by the Blackbird since I watched one make a low level pass at Oshkosh 27 years ago, then light the burners and climb away at a 45 degree angle until it was out of sight. Like probably every other pilot, I’d heard and read about the SR-71 before, but seeing the real thing in flight was a special experience. 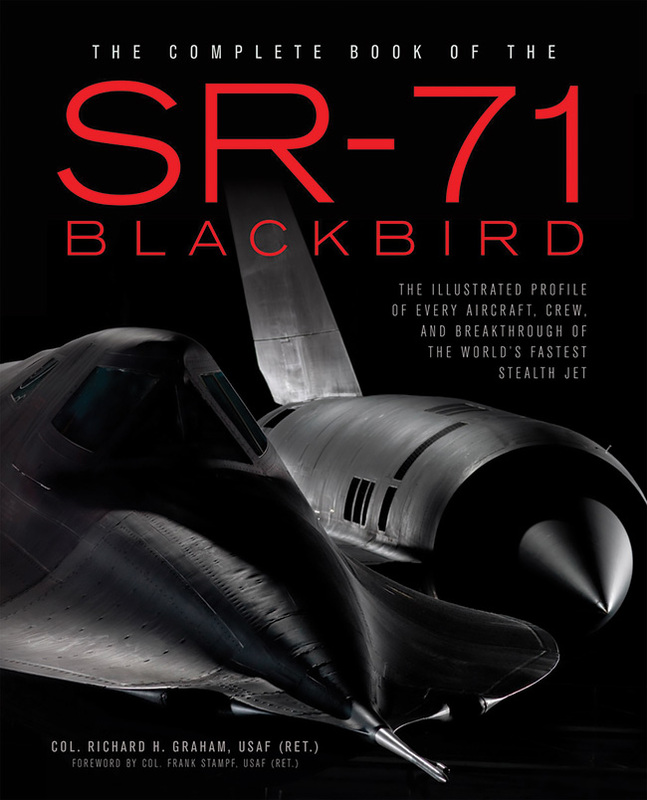 Since then, I’ve read everything I could find on the Blackbird, and “The Complete Book of the SR-71” is perhaps the definitive work. It tells the story of the world’s fastest jet, from its creation by Kelly Johnson’s Skunk Works in the late 1950s, to its eventual retirement in the late 1990s. The airplane was conceived as an ultimate follow-on to the U-2, a single-seat jet that flew nearly as high but only about a quarter as fast. At the time, titanium was the only material that could withstand the extreme high temperatures—above 500 degrees F—associated with skin friction at Mach 3.0 or higher. Like any airplane designed to withstand extreme aerodynamic heating at 2000 knots, the SR-71 expanded as it heated up. In standard cruise flight, the Blackbird’s fuselage grew a foot longer than when parked on the ramp. 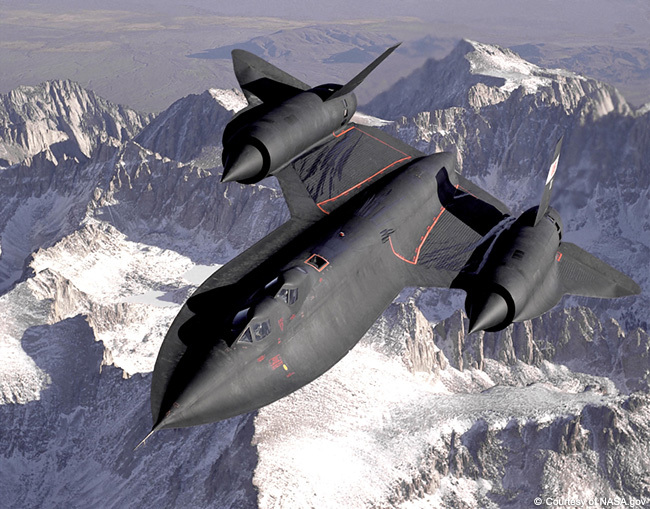 SR-71s were also among the first aircraft in the U.S. arsenal to incorporate a primitive form of stealth technology. Little was known about shielding aircraft from radar in the 1950s, but Johnson’s team nevertheless succeeded in reducing the airplane’s radar signature to a mere fraction of normal. The SR-71, a product of Lockheed’s famous top-secret Skunk Works, was stealthy before “stealth” was a thing. 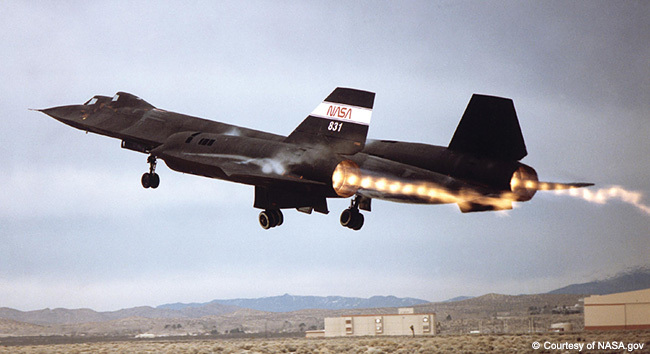 The Blackbird’s P&W J-58 engines were rated for 34,000 pounds of thrust each and were operated in nearly continuous afterburner during cruise. The engine was originally developed for use on the Navy’s Martin P6M flying boat, but was redirected to the A-12 and SR-71 when the Navy project was cancelled. Each engine developed about 160,000 shaft horsepower. Blackbirds typically departed with about half tanks and hooked up with a tanker following the seven-minute climb to 30,000 feet. In keeping with its high-altitude, reconnaissance mission, the airplane required a special fuel, JP-7, that could burn in the thin air at 80,000 feet. The fuel had to have a very high flash point to keep it from igniting in the tanks because of the heat buildup during Mach 3.0 flight. As fuel was depleted, inert nitrogen was pumped into the tanks to further guard against ignition. The Blackbird demanded its own, dedicated tankers, designated KC-135Qs. In an emergency, the Blackbird could accept standard military jet fuel but was then limited to Mach 1.6. After refueling, the climb to the airplane’s 15-mile-tall cruise altitude usually required 15 minutes. Level at cruise, the SR-71 was travelling faster than the muzzle velocity of a 30.06 rifle bullet, and the crew knew they were virtually immune from enemy action. Despite its amazing performance, the SR-71 was not a fighter. In fact, it carried no protective armament or weapons of any kind, though It did have radar jamming capability to confuse SAM sites. The Blackbird’s only real protection from ground or inflight threats was pure, simple speed. The airplane was tasked with flying an extremely accurate profile in order to photograph a specific ground track. It was dedicated to the reconnaissance role, and any deviation from flight plan at 33 nm a minute could nullify or at least degrade the results. An SR-71 could fly its mission faster if necessary, but it couldn’t vary its heading by much, or the resulting photogrammetry might become useless. All the numbers on the SR-71 were right out of Star Wars. The SR could fly as high as 85,000 feet, but was more typically operated at 75,000 to 80,000 feet, three to four miles higher than the Concorde. The ultimate reconnaissance tool had a voracious appetite, burning about 135 gallons of JP-7 per engine per minute. That’s works out to a total of 16,000 gallons an hour or just over one and a half gallons a second. Despite its amazing performance, the SR-71 was not a fighter. In fact, it carried no protective armament or weapons of any kind. Unlike the U2 that suffered from an extremely critical Mach at high attitude (under some conditions, the difference between stall and overspeed in the U2 was only four knots), the SR maintained a reasonable flight envelope, even at 75,000 feet. For that very reason, the vetting process for prospective Blackbird pilots was very different from what you might expect. The USAF wasn’t looking for Top Gun fighter jocks, eager to turn and burn in high G dogfights, though heavy fighter experience was a plus in some respects. One Blackbird aviator told me it was rare to exceed 45 degrees of bank, and the airplane spent the majority of its time in straight and level flight, the better to accomplish its mission of photo reconnaissance. Operating at Mach 3.0, the SR-71 needed roughly 70 nm to complete a 180 degree turn. The man in the front seat was as much a systems manager as he was a pilot. His training and selection process required a full year before he was accepted as a Habu, a nickname borrowed from a small, black pit viper indigenous to the island of Okinawa, and applied to crewmen and the airplane itself. The airplane carried a two-man crew, a pilot up front and a Reconnaissance Systems Officer in back to handle navigation and the complex of cameras, sensors and jamming equipment. The two men flew as a team and were not allowed to fly the SR-71 with other crew members. If one crewman was sick, the other was grounded, as well. The Blackbird was capable of sustained speeds in excess of Mach 3.0, about 1730 knots, and redline was supposed to be limited to Mach 3.3. In one mission over Libya in 1986, however, pilot Brian Shul’s back-seater warned of surface-to-air missile launches, and Shul pushed the thrust levers full forward for several minutes. At one point, he was advised that he’d outrun all the missiles and was blazing along at Mach 3.5 (2020 knots). During the airplane’s 35-year service life, some 1000 missiles were fired at the SR-71, and none even came close to catching it. Of the 32 airplanes that were built, a shockingly high 12 of them were lost, though none of those to enemy fire. One very real hazard for early Blackbird pilots and RSOs was an “unstart”. The J-58 engines employed an automatic inlet system that adjusted the airflow to keep it subsonic when the airplane was cruising above Mach 1.0. A spike at the inlet leading edge moved forward and aft as much as two feet to manage intake air and maintain a subsonic flow through the engine. When the system failed, a violent shock wave moved forward through the inlet and the reduced thrust caused the airplane to yaw violently toward the affected engine. Pilots had to manually reposition the inlet spike to bring the engine back on line or the aircraft could break apart from the stress. In order to avoid jamming interference with ground-based or even satellite-based nav aids, the SR-71 employed an Astro-inertial Navigation System, essentially a computerized, celestial nav. As the name implies, this utilized star sights for position information. At 80,000 feet, most of the atmosphere was well below the Blackbird, and the sky above was pitch black with only celestial light from stars, moon and sun. Despite the obvious hazards of flying as far out on the edge as anyone could, only one crew member was killed during the span of the SR-71 program. Jim Zwayer, a Lockheed RSO, died when the SR-71 disintegrated around him on a test mission out of Edwards AFB. Not surprisingly, the Habu held every ultimate record for sustained speed and altitude and many for city-to-city flights. 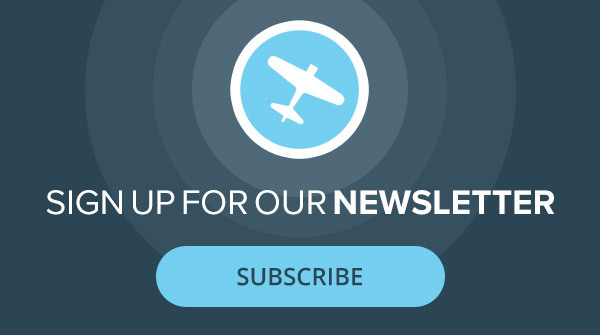 It was the fastest air-breathing aircraft ever to fly, then and now. My dad, Vic Horton, flew backseat in the NASA Blackbirds with pilot Fitz Fulton. The celestial nav system was amazing, triangulating off of 3 stars. But it had its quirks. One time the nav system on an Air Force Blackbird locked on 3 pinholes in the roof of one of the “barns” at Beale AFB! I remember seeing him with a map, plotting flight paths and vortac frequencies along the California coast for a flight out over the Pacific Ocean. When the nav system failed 200 miles out over the ocean, he pulled the map out of his knee pocket and got them headed home. He said the signal out of Santa Maria was the best thing he’d heard in his life.